A cup of yogurt is a great way addition to your daily diet, whether it be as a part of your breakfast or as a way to finish off your lunch. However, yogurt is also a valuable source of probiotics. In fact, Tobi Page, a Portland-area dietitian, encourages all of her clients to get a dose of this healthful bacteria daily. "They are a natural part of our system," Page, with Eating is a Lifestyle (eatingisalifestyle.com), said. "They're the healthy bacteria that live in our gut (intestine). They help to fight bad bacteria, so there's a little war going on." According to Page, in our environment, perhaps with stress, our natural probiotic numbers can lower. This can allow bad bacteria numbers to elevate, creating conditions including irritable bowels and allergies. Probiotics help to keep the lining of the gut healthy by killing bad bacteria. Page said, "An unhealthy gut is more permeable, allowing viruses, pollens and other large proteins to enter the body. This triggers the immune system, which leads to systemic, chronic inflammation." Page continued, "Having a healthy gut is essential for reducing your risk of many chronic diseases. From keeping the bad guys out, to allowing for the best absorption of the nutrients in our food, probiotics are the best first step to optimizing your health." While probiotics naturally occur in our body, there are forces that battle them. "Stress, unhealthy food and antibiotics all work to kill them," Page said. "So we need to keep the numbers up by eating fermented foods and/or taking supplements. Most people don't realize that our digestive tract, like our skin, is really our first line of defense against bacteria and viruses." Some of your favorite foods contain probiotics. "Yogurt is the most well-known source in food," she said. "That's a pretty readily available, widely accepted food — yogurts tend to have, maybe, 3 to 5 different strains, and that's pretty good for your average person." Page said more products are coming out on the market, adding, "Fermented foods would be our next rich source of naturally occurring probiotic foods, as opposed to taking supplements." The process of fermentation is done through the bacteria. "It requires the bacteria to ferment," Page said, noting fermented food products include sauerkraut, kimchi and kombucha. When looking for sauerkraut, Page suggests you check the label for "raw" or "live" or "probiotics." Probiotics may not be known to everyone. "Most people are not aware of what probiotics do for us. They've heard of them before," Page said. "Unless I explain how they can help prevent even colds, flu and allergies, then people are a lot more likely to want to start taking them." If you want to get on the probiotics bandwagon, you need go no further than the dairy case at your neighborhood grocery store. Yogurt is an excellent source of this good bacteria, but you'll probably be faced with a great many yogurt choices. Page's recommendation: Low-sugar yogurt. Greek yogurt is a great pick. If needed, sweeten with fruit and/or honey. Also, consider probiotic supplements. "They are an easy way to ensure you're getting enough," Page said. "Just add them to your vitamin D, which just about everybody in Portland should be taking as well. What I typically tell people when they want to find a supplement — if they do not already have inflammation issues or gut issues - you can get away with a lower end supplement, one that has, maybe, three to five different strains in it." On the other hand, for somebody with issues with gut integrity, Page may recommend a higher-end supplement, which may have 14 or 15 different strains. "Pick your price point that you're comfortable paying," Page said. "Then look for the one that has the most number of different bacteria at that price point. That's how I recommend choosing a probiotic." Page takes probiotics as preventive medicine. 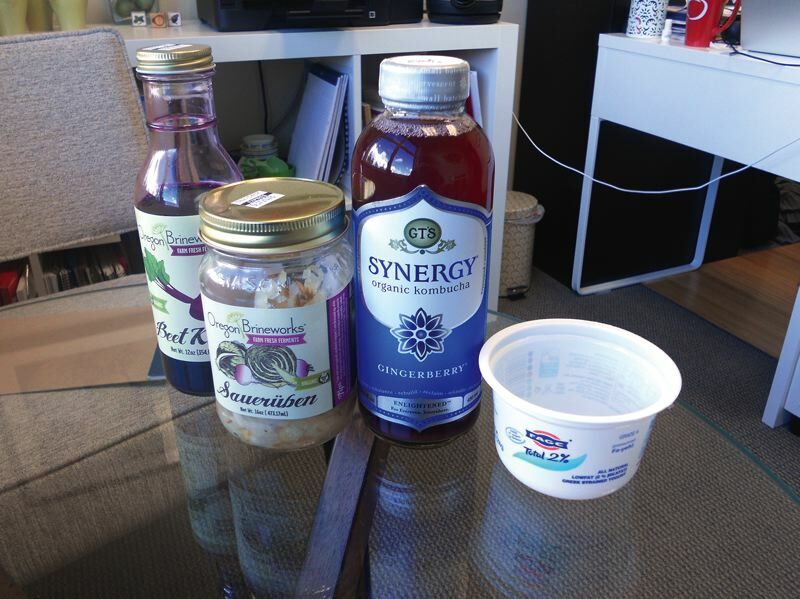 "I recommend probiotics to every single person out there, whether you have gut issues or not."